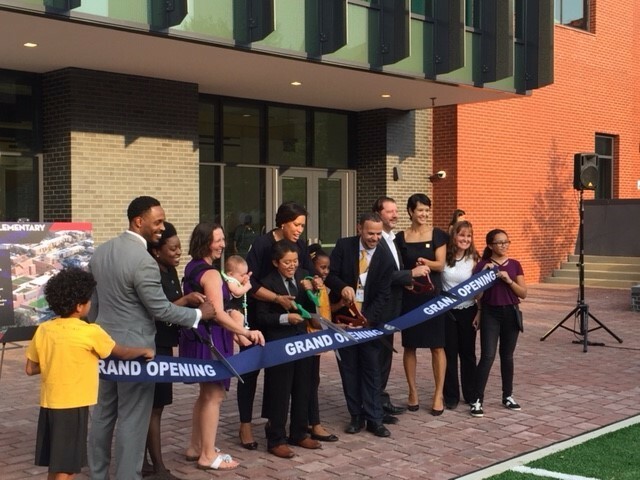 Mayor Muriel Bowser joined school officials and our project team to celebrate the Ribbon Cutting at Bancroft Elementary School. Built in 1923, Bancroft has been educating the diverse youth of the Mount Pleasant neighborhood for nearly a century. Known for its premiere dual language programs, Bancroft Elementary educates children from kindergarten through fifth grade in both English and Spanish. Partnered with DC DGS and Ayers Saint Gross on this design-build project, the team modernized and restored the historic school site. There have been several renovations and additions throughout the school's history. As a result, five adjoined buildings stood staggered on the slope leaving the school with inefficient floor levels and major accessibility issues. Partnering with Fielding Nair International, Ayers Saint Gross captured the history of the neighborhood and incorporated several social and ecological features in the design to overcome this issue. Special features include an internal street that follows the natural slope of the site, unifying the school with ramps and elevators mirroring a street of an old Spanish town, two new academic wings set to scale with the surrounding neighborhood, and a new storm water management system intended to educate the students on sustainability practices and their impact on the watershed. "From the Fall of 2016 to today, this building has gone through a total transformation, said Megan Ross, the assistant superintendent on the Bancroft team. "Despite multiple changes and owner requests, our team was able to meet deadlines and complete the project on time for the start of the school year. The multi-cultural community will highly benefit from these new unique spaces." The 132,447 SF renovated building is targeting LEED gold certification. The project team worked around the clock to ensure that the children of Mount Pleasant would have the space and resources necessary to continue to learn and grow by the new school year. We are excited to have been a part of this successful project.